Chris Reddy is a Norwegian South African artist who grew up under the northern lights and the midnight sun above the arctic circle in northern Norway. His awareness of place, time, politics, philosophy and the rights and wrongs in this world was stimulated from a very early age through the place he grew up and the contrast to what was going on in his fatherland, a South Africa that was a racist state based on a system of apartheid which his father was an important part in helping to defeat. Drawing was a passion from early on and when Hip Hop and grafitti exploded upon the world, he felt that this was his call to take his art public. From 1984 at the age of fourteen he started making murals and grafitti, but seeing how conservative this one quarter of hip hop´s four pillars was, he felt it necessary to rethink and get deeper into how art can be more humane, less rigid, expressive and personal. Seven years later, he had done artschool, art history in University and the academy of fine arts in Oslo, while also forming and performing as a drummer in a band that insisted on the ideas from the punk and DIY scene. A record label to release the music was founded and a recording studio to record their music and other bands in the scene in Oslo was created. 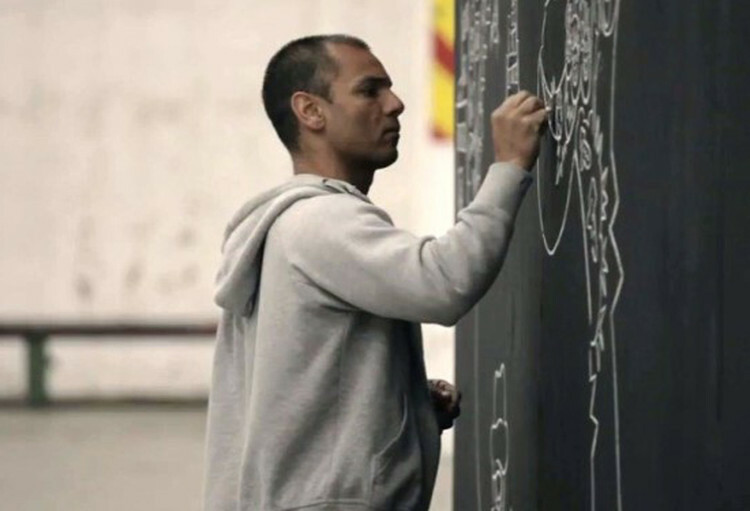 In 1999 Reddy got his MFA from the National Academy of art in Oslo. Basing his praxis on humanism, ideas from the existentialist movement, drumming, dancing and studies of anarchism, philosophy and politics in general Reddy has done all sorts of projects that all seem to have an open and playfull energy to them. He claims that his work is based on realisations of philosophical ideas, rythm and energy and his goal is to be in the eternal moment and exist in flow. Reddy´s works as an artist exist after the crative process is over. They are not carefully planned works aiming to tell a certain story or contain a specific topic. He himself never knows what his work will look like, only that it is based on his drawing skills and that it pours out of him in a stream of consciussness or unconscioussness - right there where there is control and where control is gone. His drawings are filled with the conversations he has had, details from peoples features he has seen, objects, lines, patterns and symbols he likes and rythms and musical tracks he has heard or feels is inside him. He has said that his drawings are the visual representation of the music he has inside. Chris has done murals, gallery shows, groupshows, street art, live drawing performances, concerts, prints, paintings, rugs, represented art in the Chess Olympiad, worked with fashion via North Face and Tom Wood and he is at it every day - making new work in Norway and the US.